Untitled. Probably a plan and elevation. BAB/A/001 The first drawing of the circular arrangement of the new engine. BAB/A/002 Untitled. This drawing is a cardboard model. BAB/A/003 Sketch of a plan for reserving the carriages. BAB/A/004 Figure 1, Plan / Figure 2, elevation, Figure C Carriage No 4. BAB/A/005 Figure 3. Zero Apparatus No. 1. Improved arrangement of snails, figure wheels et cetera for design dated 27 September 1834 and also for a design dated 24 January 1835. Elevation. BAB/A/006 Addition No. 4. Carriage No 6. Elevation and plan. BAB/A/008 Stepping No. 1 on or in central wheels. Figure 1. Figure 2. Various unnumbered elevations, plans and details. BAB/A/009 See designs dated 1834 November 27 and 1834 December 29. BAB/A/010 Plan for existing system of two racks. Arrangement plan and four detail elevations. BAB/A/011 Figure 1. Plan, elevation and detail. BAB/A/012 Sketch of a method of multiplication by means of the directive power stepping. Plans, elevations and details. BAB/A/013 Figure 1. Stepping No. 2. Sketch to examine a method of multiplication by stepping. Plan, elevation. BAB/A/014 Carriage No. 8. Figure 1. Method of carrying. Plan, elevation. BAB/A/015 Method of grouping for the large machine. BAB/A/016 Method of grouping for the large machine. BAB/A/017 Grouping arrangement. Abandoned end April 1835. BAB/A/018 Sketch No. 5. Two parts each. 1835 July 4. General arrangement. BAB/A/019 Sketch No. 7. Two parts each. July 4 1835. General arrangement. BAB/A/020 Figure 1. Sketch 7*, circular arrangement. BAB/A/021 Gearings, et cetera of Sketch No. 8 dated July 31 1835. Arrangement. BAB/A/023 Gearing et cetera of Sketch dated July 31 1835. Plan, once part of Drawing 22. BAB/A/024 No. 1 lifters for the purpose of division by table. Notation and description in sheets 11 and 12 of large quarto notations. Plan, elevation. BAB/A/025 Figure 1 Sketch No. 9, arrangement. Examination of stepping by long pinion shifting a whole cage. Elevation. BAB/A/026 Sketch No. 10*, circular, arrangement. Shows 26 variables. BAB/A/027 Sketch No. 11, circular, arrangement. Shows 27 variables. BAB/A/028 Elevation and formulae for gear trains. Uses differentials for speed adding. BAB/A/029 Method of bolting to platforms for vertical motion of axes, plan. BAB/A/030 Sketch of sectors for giving vertical motion to axes. Arrangement, design, sketch for interference. BAB/A/031 Sketch of sectors for giving vertical motion to axes, arrangement. BAB/A/032 Figure 1. First method of stepping by long pinions, elevation. BAB/A/033 Sketch 12. Stepping by the method designed 15 April 1836. Circular arrangement, 27 variables. BAB/A/034 Sketches of mill used for arranging operations on the engine of four wheels in each cage from April 1836 - August 1837. BAB/A/035 Method of governing barrels et cetera. No. 1, plan of elevation. BAB/A/036 Counting apparatus No. 1. Plan, elevation. Apparently for counting steps in multiplication, division and square root. BAB/A/037 Figure 1. Carriage No. 10. Plan of carrying by circular connection (chain). Plan, rejected. Scribbling Book, volume 2, page 207 et cetera. BAB/A/038 Carrying No. 13 Sketch of a method of carrying by circular connection. Plan, two elevations, description 4 November 1836. Rejected, No. 14, 13 October 1835 to be retained. BAB/A/039 Adding No. 6, carrying No. 14. Sketch of a method of adding and carrying intended for a Difference machine. Designed between 31 October 1836 and 12 November 1836. Plan, elevations, details, description. BAB/A/040 Adding No. 7 Carriage. No. 15 Sketch of a method of adding and carrying with anticipation. Intended for a Difference Machine or an Equation Difference Machine. Plan, elevations, description. BAB/A/041 Figure 1. Carriage No. 16. Method of carrying; intended for the Great Machine. Plan, elevation, notation, details. Description 24 February 1837 with additional sketches and notes. BAB/A/042 Sketch 13. General arrangement, circular. Showing 30 variables, 5 barrels with reducing apparatus, punch card mechanism, printing apparatus. Notes introduction of great bevel wheel 18 March 1837. BAB/A/043 Intended for engraving. Shows six barrels with reducing apparatus. BAB/A/044 Part 1. Plan sequence of meshings. BAB/A/045 Elevation of arrangement 13 with some of the driving and directive. Elevation includes section of a barrel '65 bands 80 verticals'. BAB/A/046 Sketch of sectors for lifting the axes. BAB/A/047 Sketch of the sectors for moving axes of store vertically. BAB/A/048 Part 1. Plan and elevation of adding wheels, long pinions and intermediate pinions, plan, two elevations. Part 2. Lifting axes and fixed wires, plan, elevation. BAB/A/049 Sketch of wheels for reducing carrying figure wheel axes to zero and setting spiral axes. Sketch elevations. BAB/A/050 Lifters for selecting the multiple of the Multiplicand or Divisor. Plan, two elevations. BAB/A/051 No. 1 Apparatus for registering quotient. BAB/A/052 Carriage and method of setting spiral axes for a machine of 50 cages with two figure wheels in each cage. Plan, elevation, details. BAB/A/053 Centres of axes and pen sketches of lockings for Sketch 14. Arrangement. BAB/A/054 Sketch 14. Arrangement, probably incomplete. BAB/A/055 Centres of axes and sketch of lockings for Sketch 15. BAB/A/056 Part 1. Opened out view of Plan 14. Part 2. Opened out view of Plan 16. BAB/A/057 Part 2. Sketch of some of the centres, et cetera for Plan 16. Arrangement. BAB/A/058 Part 1. Sketch of some of the centres et cetera for Plan 16. Arrangement. BAB/A/059 Sketch of some of the centres et cetera for Plan 16. Arrangement. BAB/A/060 Plan 16. Arrangement, several partial arrangements, numerous notes. BAB/A/061 Wheels for driving the adding axes. Plan. BAB/A/062 Sketch of sectors for lifting the axes. BAB/A/063 Sketch of a decimal counting apparatus. Plan, elevation, description. BAB/A/063/1 Sketch of a decimal counting apparatus. BAB/A/067 Combinatorial and decimal counting apparatus comprising plan, elevation and description. BAB/A/068 Selecting apparatus similar to that described in Sketch Book volume 3, page 54. BAB/A/069 Figure 1. Clutch et cetera for driving the adding axes. Plan, elevation. BAB/A/072 Tools for the machine. BAB/A/073 Tools for the machine. BAB/A/074 Opened out view of figure wheels, 1-42. BAB/A/075 Plan 17, store on a rack. Arrangement. BAB/A/076 Plan 21, store on a rack. Arrangement. BAB/A/077 Sketch of General Plan No. 22. Arrangement and rack. Discussed and rejected. BAB/A/078 General Plan No. 23. Arrangement and rack. BAB/A/079 Plan No. 24. Arrangement and rack, rearrangement or notes. BAB/A/080 Sketches of parts of a carriage similar to that drawn upon No. 81. Plan, elevation. BAB/A/082 Plans of parts of one of the selectors belonging to either of the nine multiples. Plan. BAB/A/083 Elevation of one of the selectors belonging to either of the nine multiples. BAB/A/084 Axes, wheels et cetera for applying the superposition of motion to the units' wheels of the selectors drawn upon No. 82 and 83. Plan, elevation. BAB/A/085 Sketch of central wheel and principal framing. Plan, elevation. BAB/A/086 Plan and section of an 8 inch figure wheel; hoarding carriage and framing plate. Plan, elevation. BAB/A/088 Elevation opened out of barrel and reducing apparatus. BAB/A/089 Plan 25. Arrangement and rack. BAB/A/089/1 The general plan of Mr. Babbage's Great Calculating Engine. Arrangement and rack, details, et cetera. BAB/A/091 Plan 27. This was superseded by Drawing 93. Linear arrangement. BAB/A/092 Carriage by vertical chain. Plan, elevation. BAB/A/093 Two sheets probably relating to Plan 27 of the Analytical Engine. BAB/A/093/1 Plan 27. Linear arrangement with letter notations. BAB/A/093/2 Plan of the Analytical Engine without lettering. BAB/A/094 Two sheets relating to detailed sketches of the Analytical Engine. BAB/A/094/1 Sketch elevation of the driving and directive of the Analytical Engine. BAB/A/094/2 Tracing sketch of the Analytical Engine. Elevation. BAB/A/095 Mill counting apparatus. Consecutive plan. BAB/A/096 Mill counting apparatus. Consecutive elevation. BAB/A/097 Long pinion for giving off complement. Plan, elevation. BAB/A/099 Long pinion for giving off complement. BAB/A/100 Self acting consecutive carriage. Plan, elevation and description. BAB/A/101 Examination and discussion of a new general plan. BAB/A/102 Unfinished sketches of anticipating whole and half zero carriage. Plan, elevation. BAB/A/103 Figures 1 and 2. Sketches of a tens chain for carriage for whole and half zero. Plan, elevation. BAB/A/104 Sketch of part of a carriage for whole and half zero. Plan. Wheels and pinions for part of centre group for Plans 28 and 28a. BAB/A/105 Positions of wheels, guides for moveable framing, et cetera. BAB/A/106 Anticipating whole and half zero digit counting carriage. Plan, elevation and details. BAB/A/107 Parts of the slide for Planing machine. Plan, elevation. BAB/A/108 Parts of the slide for the Planing machine. Plan, elevation. BAB/A/110 Parts of the slides for the Planing machine. BAB/A/111 Parts of the slide for the Planing machine. BAB/A/112 Parts of slide for the Planing machine. Plan, elevation. BAB/A/114 Planing machine. Elevation, details. BAB/A/114/1 Part of the Planing machine. BAB/A/115 Chuck for Planing machine. Plan, elevation. BAB/A/116 Parts of slide tool for Planing machine. Plan, elevation. BAB/A/116/1 Sketch of drilling machine. Details. BAB/A/117 Sketches of cams for consecutive carriage. BAB/A/119 Sketch of an anticipating whole and half zero carriage. Plan, elevation. BAB/A/120 Axes D1 E1 for the left hand group of Plan 28. Plan, elevation. BAB/A/121 Axes D E G H for the right hand group of Plan 28. BAB/A/122 Improved framing for centre group of Plan 28. Arrangement, plan. BAB/A/123 Sundry axes and wheels for Plan 28. BAB/A/124 First sketch of all the parts in plan of the right half to middle group of General Plan 28. Plan, elevation. 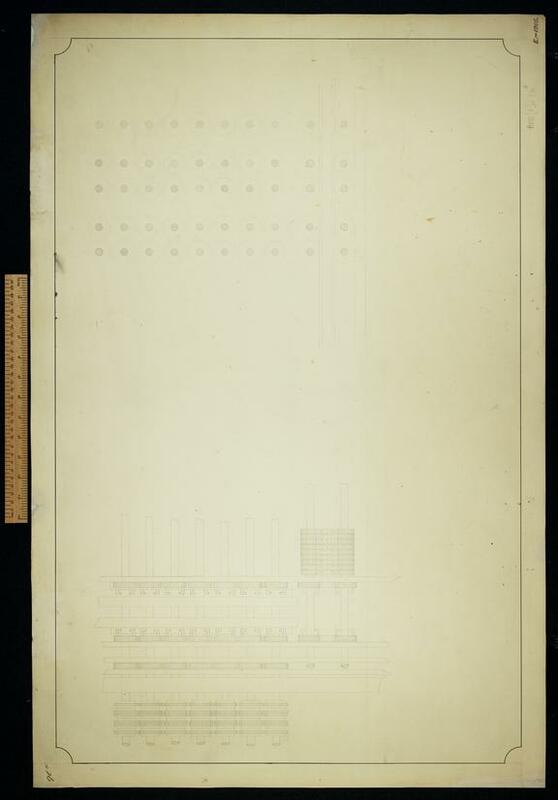 BAB/A/125 Plan of consecutive mill counting apparatus for General Plan 28. Plan, note. BAB/A/126 Elevation of consecutive mill counting apparatus for General Plan 28 and 28a. BAB/A/127 Plan of the left half to middle group for General Plan 28. BAB/A/128 Plan and section of a large chuck for Planing machine. Plan, elevation. BAB/A/129 Elevation of parts of middle group drawn in plan on No. 127. BAB/A/130 Elevation of parts of middle group drawn in plan on No. 127. BAB/A/132 Plan of operation and variable card counting apparatus. Suited to Plans 28 and 28a. BAB/A/133 Elevation of parts of the card counting apparatus for operation and variable cards. BAB/A/134 Elevation of parts of the card counting apparatus for operation and variable cards. BAB/A/135 Apparatus for registering the quotient adapted to Plan 28a. Plan, elevation and detail. BAB/A/136 Sketch of a half zero anticipating carriage. Plan, description and note. BAB/A/137 Plan and new method of counting off for mill counting apparatus. Elevation, detail. BAB/A/138 Sign apparatus. Plan, elevation. BAB/A/139 Sign apparatus for Plan 28a. Plan, elevation. BAB/A/140 Table and store axes for Plan 28a. Plan, elevation and note. BAB/A/141 Sketch of an apparatus for lifting the axes of the Analytical Engine. Plan, elevation. BAB/A/142 Apparatus for combining incommensurable cycles. Plan, elevation. BAB/A/144 Anticipating whole zero carriages. Figure 2 by vertical chain. Plan, elevation. BAB/A/145 Plan and elevation for the calculating part of the Difference Engine. Figure 1. Superseded. Consecutive carriage. BAB/A/146 Sketches of the printing and stereotyping apparatus of the Analytical and Difference Engines. Superseded. Plan, elevation. BAB/A/147 Stereotype frames for Analytical and Difference Engines. Plan, elevation. BAB/A/148 Sketch of an apparatus for advancing stereotype frames of the Difference Engine by cranks and backing them by weights. Superseded. Plan, elevation. BAB/A/149 Speculations on the driving and directive for the Difference Engine. Superseded. Arrangements. BAB/A/150 Difference Engine wheels for driving the cranks which move the matrix frames. Superseded. Plan, elevation. BAB/A/151 Speculations on the driving and directive of the Difference Engine. Superseded. Plan, elevation. BAB/A/152 Paper rollers of the printing apparatus for the Analytical and Difference Engines. Superseded. Plan, elevation. BAB/A/153 Untitled elevation of the printing and stereotype apparatus. Superseded. BAB/A/154 Speculations on the driving and directive of the Difference Engine. Superseded. Arrangement. BAB/A/155 Speculations on the driving and directive for the Difference Engine. Elevation. BAB/A/156 Plan of the apparatus for stereotyping and printing for both the Analytical and Difference Engines. Superseded. BAB/A/157 Plan and elevation of part of the directive of the Difference Engine. Superseded. BAB/A/158 Plan and elevation of the driving and directive of the Difference Engine. Superseded. BAB/A/159 General plan and details of cams for driving calculating axes. BAB/A/160 Untitled elevation. Table of symbols on reverse. BAB/A/161 General plan and detail of the driving of the calculating part of the Difference Engine No. 2. BAB/A/162 Part of frame for supporting stereotype axes. BAB/A/163 Elevation of Difference Engine No. 2. BAB/A/164 Plan of the Difference Engine No. 2. BAB/A/165 Details of Difference Engine No. 2. Plan, elevation. BAB/A/166 Apparatus for moving stereotype frames for Analytical and Difference Engines. Plan, elevation. BAB/A/167 Elevation and end view of part of general framing. Plan. BAB/A/168 Plan and end view of cams et cetera for vertical motion to calculating axes. BAB/A/169 Plan of cams for locking odd Difference figure wheels and for vertical motion of even Difference warning. BAB/A/170 Plan of cams for circular motion of even difference axes. BAB/A/172 End view of inking printing paper and stereotype apparatus. BAB/A/173 Plan of inking printing and stereotype apparatus. BAB/A/174 Rack pinions for connecting table figure wheels with printing stereotype sectors. Elevation. BAB/A/175 Plan of cams for punching with small stereotype sectors and cams for removing paper rollers. BAB/A/177 Bars and levers for lifting axes of the Difference Engine No. 2. Plan. BAB/A/179 Untitled. Appears to be layout of axes on framing of Difference Engine No. 2. Plan of the calculating axis and framing of the Difference Engine. BAB/A/180/1 Untitled. Plan for raising axes (vertical motion) of the Difference Engine. Locking plates and travelling platforms. BAB/A/181 Plan and elevation of a platform for giving circular motion to axes applied as an experiment to the Difference Engine No. 2. Drawing 163. BAB/A/182 Untitled. Plan of locking plates for locking axis circularly and vertically. BAB/A/183 Untitled. Plan of the universal and general locking plates. Plan and elevation of the locked arms. BAB/B Drawings and tracings of Difference Engine No. 2. BAB/B/001 Elevation of Difference Engine No.2. BAB/B/002 Plan of Difference Engine No. 2. Tracing of BAB A/164. BAB/B/003 Difference Engine No. 2. Addition carriage and mode of driving the axis. Tracing of BAB A/171. BAB/B/004 Plan of the calculating part with the means of conveying numbers to stereotype sectors. Tracing of BAB A/176. BAB/B/006 General plan and detail of the driving of the calculating part of Difference Engine No. 2. Tracing of BAB A/161. BAB/B/006/1 Plan of part of framing of Drawing 161. Tracing of BAB A/161. BAB/B/006/2 Plan of part of framing of Drawing 161. Tracing of BAB A/161. BAB/B/006/3 Plan of part of framing of Drawing 161. Tracing of BAB A/161. BAB/B/007 General plan and details of cams for driving calculating axis. Also the disconnecting apparatus. First mover. Tracing of BAB A/159. BAB/B/008 End view and side elevation of driving and lifting apparatus. BAB/B/008/1 Part of framing shown on 160. Tracing of BAB A/160. BAB/B/008/2 Part of framing of Drawing 160. Tracing of BAB A/160. BAB/B/008/3 Elevation of part of framing of Drawing 160. BAB/B/012 Rack pinions for connecting table figure wheels with printing stereotype sectors. Elevation. Tracing of BAB A/174. BAB/B/013 End view of inking printing paper and stereotyping apparatus. Tracing of BAB A/172. BAB/B/018 Stereotype frames for Analytical and Difference engines. Plan, end view and elevation. Tracing of BAB A/147. BAB/B/019 Apparatus for moving stereotype frames for Analytical and Difference engines. Plan, end view and elevation. Tracing of BAB A/166. BAB/C/117 Digit counting apparatus upon axes of the left hand group of Plan 28. Plan, description and notation. BAB/C/127 Plan of left half of middle group for General Plan 28. BAB/C/129 Elevation of parts of middle group drawn in plan on No. 127. BAB/C/130 Elevation of parts of middle group drawn in plan on No. 127. BAB/C/131 Plan and elevation of sundry parts in the upper cages of left half of middle group. BAB/C/135 Apparatus for registering the quotient adapted to Plan 28a. BAB/D/001 Analytical Engine. Sheet No. 1. Sections of store wheels and their framing selectors. BAB/D/002 Digit counting apparatus on the two upper wheel selectors. BAB/D/003 Carriage with tens warning. Sheet 3. BAB/D/004 Digit counting apparatus. Sheet 4. BAB/D/005 Frame lifting bar and selectors. Sheet 5. BAB/D/006 Sections of framing and racks. Sheet 6. BAB/D/007 Digit counting apparatus spiral axis. Sheet 7. BAB/D/008 First draft of selecting apparatus. Sheet 8. BAB/D/009 Lifting apparatus by screw. Sheet 9. BAB/D/010 Carriage and racks in sections. Sheet 10. BAB/D/011 Plan of mill with two racks. Sheet 11. BAB/D/012 Selecting apparatus. Sheet 12. BAB/D/013 Carriage axis, head and tail of product. Sheet 13. BAB/D/015 Selectors, circular framing for mill. BAB/D/016 Circular mill. Various plans. Sheet 16. BAB/D/017 First draft of framing. Sheet 17. BAB/D/019 Side and end view of framing showing bearings for racks at Figure 1. Sheet 10. BAB/D/021 Digit counting apparatus units and tens. Sheet 26. BAB/D/022 Revised plan of mill. Sheet 27. BAB/D/023 Raising and lowering figure wheel axis. Sheet 28. BAB/D/024 Plan of mill, table wheels and carriage. Sheet 31. BAB/D/025 Platform raising apparatus. Sheet 32. BAB/D/026 Platform raising apparatus. Sheet 33. BAB/D/027 Continuation of raising apparatus. BAB/D/028 Mill. Sheet 28. Superseded by Sheet 25. BAB/D/029 Draft of the mill. Sheet 29. Superseded by Sheet 24. BAB/D/030 Plan of improved mill. The last improved copy. Sheet 30. BAB/D/031 Elevation of the mill. BAB/D/032 Long stepping mill driven by pinions. Sheet 32. BAB/D/033 Carriage, axis and wheels. Sections. Sheet 33. BAB/D/034 Plan of mill and store. First draft of revised store and mill connected. BAB/D/035 Rough draft of mill and store. Plan and elevation. BAB/D/036 Plan of mill. Sheet 35. Superseded by Sheet 36. BAB/D/037 Plan of mill. Superseded by Sheet 35 - 36. BAB/D/038 Rising platforms, advancing plate. BAB/D/039 Plan and elevation of bolts and advancing plate. BAB/D/040 Plan and elevation of bolts for store. BAB/D/041 Plan and elevation of rising platform. BAB/D/042 Wanting tooth for long stepping. Parts of adding and carriage. BAB/D/043 Wanting tooth for long stepping. Rough sketches for carriage. Attempt at break and joint for carriage. BAB/D/044 Plan of store with double mill and printing. Superseded. BAB/D/045 Printing and card punching. Printing part of the Analytical Engine. BAB/E/001 Rough draft of Universal Machine Tool. Designed and employed for obtaining the different motions. BAB/E/002 Rough draft of throw out motion for feed apparatus. BAB/E/004 Reverse motion for cross planing. BAB/E/005 Elevation and section of cross slide. BAB/E/006 Plan, elevation and section of cross slide. BAB/E/007 Back and end elevation of cross slide. BAB/E/008 Side and end elevation of feed and drawing apparatus. BAB/E/009 Side and end elevation of feed motion with shade. Second revision. BAB/E/010 Front and side elevation of feed apparatus. Showing worm and slotting motion. BAB/E/011 Side and end elevation of feed motions. Showing the bands in different colours. BAB/E/012 Elevations and sections of feed motions. Fourth revision. BAB/E/013 Small planing machine. Sheet 1. BAB/E/014 End and side elevation of Large Universal Machine. BAB/E/015 Small Experimental Machine. Sheet 5. BAB/E/016 Small Universal Machine. Sheet 6. BAB/E/018 Small Experimental Machine. Sheet 2. BAB/E/019 Plan of Large Universal Machine. BAB/F/001 Multiplication before the invention of multiplication by table. Sheet 1 of 2. BAB/F/002 Multiplication before the invention of multiplication by table. Sheet 2 of 2. BAB/F/003 Division before division by table was contrived. Sheet 1 of 4. BAB/F/004 Division continued. Sheet 2 of 4. BAB/F/005 Division continued. Sheet 3 of 4. BAB/F/006 Division continued. Sheet 4 of 4. BAB/F/007 Extraction of square root. Sheet 1 of 4. BAB/F/008 Extraction of square root. Sheet 2 of 4. BAB/F/009 Extraction of square root. Sheet 3 of 4. BAB/F/010 Extraction of square root. Sheet 4 of 4. BAB/F/011 Notation for lifters. Sheet 1 of 2. BAB/F/012 Notation for lifters for division by table, continued. Sheet 2 of 2. BAB/F/014 Bolting plates for multiplication by table. BAB/F/018 Multiplication without table. Sheet 1 of 2. BAB/F/019 Multiplication without table. Sheet 2 of 2. BAB/F/020 Bolting plates to multiply without table. BAB/F/021 Division without table. Four sheets. Sheet 1 of 4. BAB/F/022 Division without table. Sheet 2 of 4. BAB/F/023 Division without table. Sheet 3 of 4. BAB/F/024 Division without table. Sheet 4 of 4. BAB/F/025 Bolting plates to divide without table. BAB/F/026 Square root. Sheet 1 of 4. BAB/F/027 Square root. Sheet 2 of 4. BAB/F/028 Square root. Sheet 3 of 4. BAB/F/029 Square root. Sheet 4 of 4. BAB/F/030 Bolting plates to do square root. Sheet 1of 2. BAB/F/031 Bolting plates to do square root, continued. Sheet 2 of 2. BAB/F/032 Ordinary cycle of 16. BAB/F/035 Various sheets on division and multiplication. BAB/F/036 Part of a notation of division. BAB/F/040 Barrels for multiplication. Left hand side of machine. BAB/F/041 Notation of the counting apparatus, et cetera, to suit Notation 39, for multiplication. BAB/F/042 Notation for division for Sketch No. 12 ( A/33). BAB/F/043 Cycles on barrels for division. BAB/F/044 Notation for square root. BAB/F/045 Barrels for square root. BAB/F/047 Division and multiplication of 60 figures. BAB/F/048 Single machine division of 30 figures with tail. General notation. BAB/F/049 Multiplication and division of 60 figures with tail of 60. General notation. BAB/F/050 Extracted from notations F/39, F/42 and F/44 for the purpose of arranging the verticals on the barrels. BAB/F/052 Addition and subtraction. Multiplication by stepping without table (to be done in store). Division by powers of ten (stepping done in store). BAB/F/055 Copy of ordinary cycle of 16. No. 32. BAB/F/056 Counting by means of figure wheels. Division. BAB/F/059 Counting by stepping. Division. BAB/F/063 Notation of locking. Small operations. BAB/F/064 Notation of locking for multiplication and division. BAB/F/065 Notation of locking for square root. BAB/F/066 Extracted from notations of locking. BAB/F/067/1 Notation of Division. Sheet 1 of 2. BAB/F/067/2 Notation of division. Sheet 2 of 2. BAB/F/069 Notation for square root. BAB/F/070 Addition and subtraction with signs. BAB/F/071/1 Notation of division. Sheet 1 of 2. BAB/F/071/2 Notation of division. Sheet 2 of 2. BAB/F/073 Two cycles - one of 21 and one of 28 units. BAB/F/074 Notation of multiplication with hoarded carriages, beginning with the highest figure of multiplier. BAB/F/074/1 Notation of multiplication with hoarded carriages, beginning with the highest figure of multiplier. Sheet 1 of 2. BAB/F/074/2 Notation of multiplication with hoarded carriages, beginning with the lowest figure multiplier. Sheet 2 of 2. BAB/F/075/1 Notation of division. Two figure wheels in each cage. Two cycles. Sheet 1 of 2. BAB/F/075/2 Notation of division. Two figure wheels in each cage. Two cycles. Sheet 2 of 2. BAB/F/076 Two cycles of 15 and 20. BAB/F/077 Mill and rack cycles. BAB/F/077/1 Mill cycles of 15 and 20. Sheet 1 of 2. BAB/F/077/2 Racks, cycle of 20. Sheet 2 of 2. BAB/F/079 General notation of addition and subtraction with signs. BAB/F/080/1 Notation of lockings. Sheet 1 of 3. BAB/F/080/3 Notation of lockings - store. Sheet 3 of 3. BAB/F/081 General notation of addition and subtraction. BAB/F/082 Sectors, levers, et cetera in mill and store. BAB/F/083 Notation of approximative multiplication. BAB/F/084 Addition and subtraction with signs. BAB/F/085 Notation of approximative division. BAB/F/086 Notation for the directive of multiplication. BAB/F/088 Directive of addition and subtraction. BAB/F/089 Notation of the directive of multiplication in which carriages are hoarded. BAB/F/093/1 Verticals. Multiplication. Sheet 1 of 3. BAB/F/093/2 Verticals. Division. Sheet 2 of 3. BAB/F/093/3 Verticals. Approximative division. Sheet 3 of 3. BAB/F/094 Notation for the directive of multiplication. BAB/F/096 Notations for the directive of division. BAB/F/096/1 Notation for the directive of division. Sheet 1 of 2. BAB/F/096/2 Notation of the directive introduced into division for approximative division. Sheet 2 of 2. BAB/F/097 Notation of cards for multiplication, for multiplication without stepping, and for approximative multiplication. BAB/F/098 Notation of cards for division and approximative division. BAB/F/099 Cases of the combination of the algebraic and accidental sign. BAB/F/102 Notation for addition of any number of quantities, giving off and retaining every pair. BAB/F/103 Notations dealing with addition, division and multiplication. Notation for addition of any number of quantities, giving off and retaining at every addition. Sheet one of six. BAB/F/103/1 Untitled. Draft notes. Sheet two of six. BAB/F/103/2 Acting verticals in the variations of division and approximative division. Sheet three of six. BAB/F/103/3 Notation multiplication 108. Sheet four of six. BAB/F/103/4 Multiplication. Sheet five of six. BAB/F/103/5 Multiplication, division and addition for verticals. Sheet six of six. BAB/F/105 Addition and subtraction with signs and position of the verticals. BAB/F/105/1 Addition and subtraction with signs. Give off arbitrarily. Sheet 1 of 2. BAB/F/105/2 Addition and subtraction with signs. Give off after each addition. Sheet 2 of 2. BAB/F/106 Directive of Division, No. 1. BAB/F/107 Directive of multiplication, No. 1. BAB/F/108/1 Multiplication. Sheet 1 of 4. BAB/F/108/2 Multiplication, continued. Sheet 2 of 4. BAB/F/108/3 Standard case of approximate multiplication. Sheet 3 of 4. BAB/F/108/4 Approximative multiplication, continued. Sheet 4 of 4. BAB/F/109/01 Notation of division. Standard Case. Sheet 1 of 12. BAB/F/109/02 Division, continued. Sheet 2 of 12. BAB/F/109/03 Division, continued. Sheet 3 of 12. BAB/F/109/04 Approximative division. Standard case. Sheet 4 of 12. BAB/F/109/05 Approximative division, continued. Sheet 5 of 12. BAB/F/109/06 Approximative division, continued. Sheet 6 of 12. BAB/F/109/07 Approximative division, continued. Sheet 7 of 12. BAB/F/109/08 Approximative division, continued. Sheet 8 of 12. BAB/F/109/09 Approximative division, continued. Sheet 9 of 12. BAB/F/109/10 Approximative division, continued. Sheet 10 of 12. BAB/F/109/11 Approximative division, continued. Sheet 11 of 12. BAB/F/109/12 36 variations of approximative division. Sheet 12 of 12. BAB/F/110 Verticals for multiplication. Notation 108. BAB/F/111/1 Verticals for division. Sheet 1 of 4. BAB/F/111/2 Verticals for approximative division. Sheet 2 of 4. BAB/F/111/3 Verticals for approximative division. Sheet 3 of 4. BAB/F/111/4 Verticals for approximative division. Sheet 4 of 4. BAB/F/112 Cases of common and approximative multiplication and division. BAB/F/112/1 Cases of common multiplication and their corresponding variations introduced. Sheet 1 of 7. BAB/F/112/2 Cases of approximative multiplication with the arbitrary variations introduced. Sheets 2 - 7 of 7. BAB/F/113 Addition and subtraction of 120 figures. BAB/F/113/1 Addition and subtraction of 120 figures. Sheet 1 of 3. BAB/F/113/2 Addition and subtraction of 120 figures. Sheet 2 of 3. BAB/F/113/3 Addition and subtraction of 120 figures. Sheet 3 of 3. BAB/F/114 Notation of cards for algebraic addition. BAB/F/115 Algebraic addition to suit notation 114. Unfinished. Superseded by notation 122. BAB/F/116 Algebraic addition if more than 40 figures. BAB/F/116/1 Algebraic addition if more than 40 figures. Cases 1 and 2. Sheet 1 of 6. BAB/F/116/2 Algebraic addition of more than 40 figures. Cases 3 and 4. Sheet 2 of 6. BAB/F/116/3 Algebraic addition if more than 40 figures. Cases 5 and 6. Sheet 3 of 6. BAB/F/116/4 Algebraic addition if more than 40 figures. Case 7. Sheet 4 of 6. BAB/F/116/5 Algebraic addition if more than 40 figures. Case 8. Sheets 5 and 6 of 6. BAB/F/117 Notation of cards for algebraic addition if more than 40 figures. BAB/F/118 General notation of directive. BAB/F/119 Directive of Addition (Algebraic). BAB/F/120 No sheet according to the note 'none' on front page of BAB F/122. BAB/F/123 Notation of cards for algebraic addition. BAB/F/124 General notation of possible trains. BAB/F/124/1 General notation of possible trains. Sheet 1 of 3. BAB/F/124/2 General notation of possible trains. Sheet 2 of 3. BAB/F/124/3 General notation of possible trains. Sheet 3 of 3. BAB/F/125 Trains in addition in mill. Barrel divided for verticals. BAB/F/127 Cases of common and approximative multiplication and their corresponding variations introduced. BAB/F/128 Directive or courses of the verticals in common division. BAB/F/129 Trains for multiplication and variations of common and approximative multiplication. BAB/F/129/1 Trains of multiplication. Standard Case. Sheet 1 of 2. BAB/F/129/2 Trains of variations of common and approximative multiplication. Sheet 2 of 2. BAB/F/130 Distribution of the verticals on different sets of barrels. BAB/F/131 Trains of division, variations and approximative division. BAB/F/131/1 Trains of division. Standard Case. Sheet 1 of 7. BAB/F/131/3 Trains of variations 5, 6, 8, 9 of division. Sheet 3 of 7. BAB/F/131/4 Trains of variations 7 of division. Sheet 4 of 7. BAB/F/131/5 Trains of accidents in common division. Sheet 5 of 7. BAB/F/131/6 Trains of approximative division. Sheet 6 of 7. BAB/F/131/7 Trains of approximative division. Sheet 7 of 7. BAB/F/132/1 Trains of addition. Sheet 1 of 3. BAB/F/132/2 Trains of addition. Sheet 2 of 3. BAB/F/132/3 Trains of algebraic addition to suit Notation 105. Sheet 3 of 3. BAB/F/133 Distribution of verticals of the large group of the mill on seven barrels. BAB/F/134 Trains ordered by one barrel, and verticals for one barrel, group "A.
BAB/F/134/1 Trains ordered by one barrel on group "F and group "A. Sheet 1 of 2. BAB/F/134/2 Verticals for one barrel group "A. Sheet 2 of 2. BAB/F/136 Verticals used on the seven barrels of the great group in division. Standard Case. BAB/F/137 Verticals on barrels for groups "F and "A and Table. BAB/F/138 Subsidiary operations on K combined with rack and "F executed during multiplication and division in mill. BAB/F/139 Trains on "F and I during operations in mill and store. BAB/F/139/2 Trains on "F and I during subsidiary operations in store. Sheet 2 of 3. BAB/F/139/3 Trains on "F and I during subsidiary operations in store. Sheet 3 of 3. BAB/F/140 Steps of the trains in one barrel in group "F and I during operations in the mill and during subsidiary operations in the store. BAB/F/141 Enumeration of trains on groups I and "F.
BAB/F/142 Enumeration of trains on groups A F consisting of the axes A F G I 1 I J L O S.
BAB/F/143 Steps of the trains on barrels of great group for division. Standard Case. BAB/F/144 Trains of group "F I for division. Standard Case. BAB/F/145/1 Steps of trains on barrels of all the groups. Sheet 1 of 5. BAB/F/145/2 Steps of trains on barrels of all the groups. Sheet 2 of 5. BAB/F/145/3 Steps of trains on barrels of all the groups. Sheet 3 of 5. BAB/F/145/4 Steps of trains on barrels of all the groups. Sheet 4 of 5. BAB/F/145/5 Steps of the trains. Sheet 5 of 5. BAB/F/146 Enumeration of trains on groups I and "F.
BAB/F/149/1 Algebraic addition. Sheet 1 of 4. BAB/F/149/2 Algebraic addition. Sheet 2 of 4. BAB/F/149/3 Algebraic addition. Sheet 3 of 4. BAB/F/149/4 Verticals on one great barrel for algebraic addition. Sheet 4 of 4. BAB/F/150 Directive of algebraic addition. BAB/F/150/1 Directive of algebraic addition. Sheet 1 of 3. BAB/F/150/2 Directive of algebraic addition. Sheet 2 of 3. BAB/F/150/3 Directive of algebraic addition. Sheet 3 of 3. BAB/F/151 Trains of algebraic addition. BAB/F/151/1 Trains of algebraic addition. Sheet 1 of 2. BAB/F/151/2 Trains of algebraic addition. Sheet 2 of 2. BAB/F/152 Used while discussing the selecting apparatus. BAB/F/153 Used while discussing the selecting apparatus. BAB/F/154 Sketches of various notations. BAB/F/154/1 Sketches of various notations. Sheet 1 of 2. BAB/F/154/2 Sketches of various notations. Sheet 2 of 2. BAB/F/155 Tables of multiples, et cetera. BAB/F/156 Used while discussing selectors. BAB/F/157 Used while discussing selectors. BAB/F/158 Selectors. Notation for setting the shades for the nine multiples of 04321 for number and complement. BAB/F/159 Selectors. Notation for setting the cams for the nine multiples of 04321. BAB/F/160 Notation and description of the carriage drawn on Notation 81. BAB/F/161 Selectors, drawings 82 and 83. BAB/F/161/1 Selectors, drawings 82 and 83, setting. Sheet 1 of 4. BAB/F/161/2 Selectors, drawings 82 and 83, using. Sheet 2 of 4. BAB/F/161/3 Selectors, drawings 82 and 83, using. Sheet 3 of 4. BAB/F/161/4 Selectors, drawings 82 and 83, reducing to zero. Sheet 4 of 4. BAB/F/162 Used while discussing the selecting apparatus. BAB/F/163 Case of division used while discussing the selectors and selecting apparatus. BAB/F/163/1 Case of division used while discussing the selectors. Sheet 1 of 3. BAB/F/163/2 Case of division used while discussing the selecting apparatus. Sheet 2 of 3. BAB/F/163/3 Case of division used while discussing the selecting apparatus. Sheet 3 of 3. BAB/F/164 General notation of directive. First Motion. BAB/F/166/1 Notation of multiplication with hoarded carriages. Sheet 1 of 4. BAB/F/166/2 Notation of multiplication. Sheet 2 of 4. BAB/F/166/3 Notation of multiplication. Sheet 3 of 4. BAB/F/166/4 Notation of multiplication. Sheet 4 of 4. BAB/F/167/1 Division. One turn of hand for each figure of quotient. Two sets of selectors. Standard Case. Sheet 1 of 9. BAB/F/167/2 Division. Sheet 2 of 9. BAB/F/167/3 Division. Sheet 3 of 9. BAB/F/167/4 Division. Sheet 4 of 9. BAB/F/167/5 Division. Sheet 5 of 9. BAB/F/167/6 Division. Sheet 6 of 9. BAB/F/167/7 Division. Sheet 7 of 9. BAB/F/167/8 Division. Sheet 8 of 9. BAB/F/167/9 Division. Sheet 9 of 9. BAB/F/168 Verticals for multiplication. Notation 166. BAB/F/169 Verticals for division as in Notation 167. BAB/F/170 Notations of algebraic addition. To suit Plan 25. BAB/F/170/1 Notation of algebraic addition. To suit Plan 25. Sheet 1 of 3. BAB/F/170/2 Notation of algebraic addition. Sheet 2 of 3. BAB/F/170/3 Notation of algebraic addition. Sheet 3 of 3. BAB/F/171 Verticals for governing A et cetera for algebraic additions, notation 170. BAB/F/171/1 Verticals for governing A et cetera for algebraic additions, notation 170. Sheet 1 of 2. BAB/F/171/2 Verticals for governing A et cetera for algebraic additions, notation 170. Sheet 2 of 2. BAB/F/173 Sketches of various notations. BAB/F/174 Sketches of various notations. BAB/F/175 Sketches of various notations. BAB/F/176 Division. Sketches of various notations. BAB/F/177 Used while discussing selecting apparatus for small Analytical Engine. BAB/F/178 Case of division illustrating the method of selecting + or - quotient figures with one set of selectors. BAB/F/179 Approximate Division. Standard case to suit Plan 26 Drawing 90 and case on Notation 178. BAB/F/180 Sketches of various notations. BAB/F/181 Sketches of various notations. BAB/F/182 Case of multiplication adapted to Notations 183 and 206. BAB/F/183 Multiplication. Sketches of Notations. BAB/F/185 Sketches of algebraic addition. BAB/F/186 Sketches of algebraic addition. BAB/F/187 Algebraic addition of K figures. BAB/F/188 Sequences of the verticals for algebraic addition of k figures. BAB/F/188/1 Sequences of the verticals for algebraic addition of K figures. Sheet 1 of 2. BAB/F/189 Algebraic addition of K figures. Sequences of the verticals and the work ordered by each vertical. BAB/F/189/1 Algebraic addition of K figures. Sequences of the verticals and the work ordered by each vertical. Sheet 1 of 2. BAB/F/189/2 Algebraic addition of K figures. Sequences of the verticals and the work ordered by each vertical. Sheet 2 of 2. BAB/F/190 Sketches of notations for algebraic addition. Case 1, 2 and 3. BAB/F/191 Directive of algebraic addition. BAB/F/192 Directive of algebraic addition. BAB/F/193 Algebraic addition. Sequences of the verticals. BAB/F/195/1 Algebraic addition. Sheet 1 of 3. BAB/F/195/2 Algebraic addition. Sheet 2 of 2. BAB/F/195/3 Algebraic addition. Sheet 3 of 3. BAB/F/198 Work ordered by three barrels for algebraic addition of n times k figures. BAB/F/198/1 Work ordered by three barrels for algebraic addition of n times k figures. Sheet 1 of 2. BAB/F/198/2 Work ordered by three barrels for algebraic addition of n times k figures. Sheet 2 of 2. BAB/F/199 Compound addition or addition of n k figures. Notation of cards for compound addition. BAB/F/200 Algebraic addition of n times k figures. BAB/F/200/1 Algebraic addition of n times k figures. Sheet 1 of 3. BAB/F/200/2 Algebraic addition of n times k figures. Sheet 2 of 3. BAB/F/200/3 Algebraic addition of n times k figures. Sheet 3 of 3. BAB/F/201 Sequences of the verticals on each barrel for algebraic addition of k figures. BAB/F/202 Verticals on each barrel for algebraic addition of k figures. BAB/F/203 Sequences of the verticals on each barrel for algebraic addition of k figures. BAB/F/203/1 Sequences of the verticals on each barrel for algebraic addition of k figures. Sheet 1 of 2. BAB/F/203/2 Sequences of the verticals on each barrel for algebraic addition of k figures. Sheet 2 of 2. BAB/F/204 Algebraic addition of k figures. BAB/F/205 Arithmetic examples of algebraic addition of n times k figures. BAB/F/206/1 Multiplication. Sheet 1 of 3. BAB/F/206/2 Multiplication. Sheet 2 of 3. BAB/F/206/3 Multiplication. Sheet 3 of 3. BAB/F/207/1 Division. Sheet 1 of 5. BAB/F/207/2 Division. Sheet 2 of 5. BAB/F/207/3 Division. Sheet 3 of 5. BAB/F/207/4 Division. Sheet 4 of 5. BAB/F/207/5 Accidents in division. Sheet 5 of 5. BAB/F/208 Verticals for multiplication (as performed in Notation 206) on one barrel. BAB/F/209 Verticals for division (as performed in Notation 207) on one barrel. BAB/F/210 Axes, times and bands of the Analytical Engine. BAB/F/210/1 Axes, times and bands of the Analytical Engine. Sheet 1 of 2. BAB/F/210/2 Axes, times and bands of the Analytical Engine. Sheet 2 of 2. BAB/F/211/1 Mill. Sheet 1 of 2. BAB/F/211/2 Mill. Cycles of 15 and 20. Sheet 2 of 2. BAB/F/212 Algebraic addition of k figure. BAB/F/213 Algebraic addition of n times k figures. BAB/F/213/1 Algebraic addition of n times k figures. Sheet 1 of 5. BAB/F/213/2 Algebraic addition of n times k figures. Sheet 2 of 5. BAB/F/213/3 Algebraic addition of n times k figures. Sheet 3 of 5. BAB/F/213/4 Algebraic addition of n times k figures. Sheet 4 of 5. BAB/F/213/5 Algebraic addition of n times k figures. Sheet 5 of 5. BAB/F/214 Sequences of the verticals in algebraic addition of n times k figures. BAB/F/215 Arithmetic examples of algebraic addition of n times k figures. BAB/F/215/1 Arithmetic examples of algebraic addition of n times k figures. Sheet 1 of 2. BAB/F/215/2 Arithmetic examples of algebraic addition of n times k figures. Sheet 2 of 2. BAB/F/216 Sketches of notations. Table making for multiplication and division. BAB/F/217 Notation of the counting apparatus (Drawings 95 and 96) for division (Notation 218). BAB/F/218/1 Division. Sheet 1 of 6. BAB/F/218/2 Division. Sheet 2 of 6. BAB/F/218/3 Division. Sheet 3 of 5. BAB/F/218/4 Division. Sheet 4 of 6. BAB/F/218/5 Division. Sheet 5 of 5. BAB/F/219 Arithmetical example of multiplication as performed in Notation 220. BAB/F/220/1 Multiplication. Sheet 1 of 3. BAB/F/220/2 Multiplication. Sheet 2 of 3. BAB/F/220/3 Multiplication. Sheet 3 of 3. BAB/F/221 Verticals for division as performed on Notation 218 arranged on one barrel. BAB/F/222 Verticals for multiplication as performed in Notation 220 arranged on one barrel. BAB/F/224 Stepping ruled by operation cards. BAB/F/225 Multiplication of two factors, when the multiplicand has more than k, but both factors together not more than 2 k digits. BAB/F/227 Reversing sign ascertaining if a variable is zero, ascertaining if a variable has a + or - sign (supersedes 223). BAB/F/228 Counting the digits in any variable P or in any number of variables P Q R et cetera. BAB/F/231 Multiplication with three multiples. BAB/F/231/1 Multiplication with three multiples. Sheet 1 of 2. BAB/F/231/2 Multiplication with three multiples. Sheet 2 of 2. BAB/F/232 Notation of self-acting positive and negative consecutive carriage. BAB/F/233 Notation of units of consecutive half zero carriage. BAB/F/234 Notation of tens chains for the anticipating half and whole zero carriage. BAB/F/235 Notation of consecutive and half zero carriage. BAB/F/236 Anticipating half zero carriage. Addition and subtraction. BAB/F/236/1 Anticipating half zero carriage. Addition and subtraction by whole zero. Sheet 1 of 2. BAB/F/236/2 Anticipating half zero carriage. Addition and subtraction by half zero. Sheet 2 of 2. BAB/F/237 Anticipating whole and half zero digit counting carriage (Drawing 106). Addition and subtraction by whole and half zero. BAB/F/238 Digit counting by carriage. Drawing 106. BAB/F/239 Trial of a method of division. BAB/F/242 Division. Working notation belonging to Summary No. 244 which superseded Notation 241. BAB/F/243 Working notation belonging to the summary of multiplication number 240. BAB/F/245 Summary of algebraic addition. BAB/F/249 Vertical positions of the wheels. BAB/F/249/1 Vertical positions of the wheels in addition, subtraction, making table and multiplication. Sheet 1 of 5. BAB/F/249/2 Vertical position of the wheels for steppings in division and multiplication. Stepping up during division and giving off to selectors. This includes stepping up before division. Sheet 2 of 5. BAB/F/249/3 Vertical positions of the wheels in the final steppings in multiplication and preliminary steppings in division. Sheet 3 of 5. BAB/F/249/4 Vertical positions of the wheels. Sheet 4 of 5. BAB/F/249/5 Vertical positions of the wheels. Sheet 5 of 5. BAB/F/250 Cycles for division, stepping, addition and subtraction. BAB/F/251/1 Cycle of units. Sheet 1 of 3. BAB/F/251/2 Cycle of units. Sheet 2 of 3. BAB/F/251/3 Cycle of units. Sheet 3 of 3. BAB/F/252 Vertical motions of the wheels and axes of Plan 28. BAB/F/253 Multiplication. Sketch from which Notations 259 and 268 were made. BAB/F/255 Division. Periods of counting apparatus. BAB/F/256 Multiplication. Periods of counting apparatus. BAB/F/257 Mill decimal counting apparatus. BAB/F/258 Counting apparatus. Multiplication and division. BAB/F/259/1 Approximative multiplication. Sheet 1 of 5. BAB/F/259/2 Approximative multiplication. Summary of multiplication. Sheet 2 of 5. BAB/F/259/3 Approximative multiplication. Sheet 3 of 5. BAB/F/259/4 Approximative multiplication. Sheet 4 of 5. BAB/F/259/5 Approximative multiplication. Sheet 5 of 5. BAB/F/261 Plan 28. Trains, vertical positions of the wheels and algebraic addition. BAB/F/261/01 Vertical positions of the wheels of Plan 28. Sheet 1 of 23. BAB/F/261/02 Vertical positions of the wheels of Plan 28. Sheet 2 of 23. BAB/F/261/03 Vertical positions of the wheels of Plan 28. Sheet 3 of 23. BAB/F/261/04 Vertical positions of the wheels of Plan 28. Sheet 4 of 23. BAB/F/261/05 Vertical positions of the wheels of Plan 28. Sheet 5 of 23. BAB/F/261/06 Vertical positions of the wheels of Plan 28. Sheet 6 of 23. BAB/F/261/07 Vertical positions of the wheels of Plan 28. Sheet 7 of 23. BAB/F/261/08 Vertical positions of the wheels of Plan 28. Sheet 8 of 23. BAB/F/261/09 Vertical positions of the wheels of Plan 28. Sheet 9 of 23. BAB/F/261/10 Vertical positions of the wheels of Plan 28. Sheet 3 of 23. BAB/F/261/11 Vertical positions of the wheels of Plan 28. Sheet 11 of 23. BAB/F/261/12 Vertical positions of the wheels of Plan 28. Sheet 12 of 23. BAB/F/261/13 Vertical positions of the wheels of Plan 28. Sheet 13 of 23. BAB/F/261/14 Vertical positions of the wheels of Plan 28 for multiplication. Sheet 14 of 23. BAB/F/261/15 Vertical positions of the wheels of Plan 28. Sheet 15 of 23. BAB/F/261/16 Vertical positions of the wheels of Plan 28 for algebraic addition of i k figures. Cycle ordered by vertical C of centre barrel. Sheet 16 of 23. BAB/F/261/17 Vertical positions of the wheels of Plan 28 for artificial stepping of divisor. Sheet 17 of 23. BAB/F/261/18 Vertical positions of the wheels of Plan 28 for algebraic addition of k figures. Sheet 18 of 23. BAB/F/261/19 Vertical positions of the wheels of Plan 28 algebraic addition of k figures. Sheet 19 of 23. BAB/F/261/20 Vertical positions of the wheels of Plan 28 for algebraic addition of i k figures. First part of cycles ordered by verticals n and 'n of centre barrel. Sheet 20 of 23. BAB/F/261/21 Algebraic addition of i k figures. Cycle ordered by vertical "a of centre barrel. Sheet 21 of 23. BAB/F/261/22 Algebraic addition of i k figures (General Plan 28). Latter part of cycles ordered by vertical 'n of centre barrel. Sheet 22 of 23. BAB/F/261/23 Algebraic addition of i k figures (General Plan 28). Cycle ordered by vertical ""s of centre barrel. Sheet 23 of 23. BAB/F/262/1 Multiplication. Genealogy of variation of multiplication. Sheet 1 of 2. BAB/F/262/2 Multiplication. Sheet 2 of 2. BAB/F/266 Verticals for multiplication. Notation 259. BAB/F/267 Counting apparatus. Approximative multiplication and division. BAB/F/268 Approximative and common multiplication for Plans 28 and 28a. BAB/F/268/1 Approximative multiplication for Plans 28 and 28a. Sheet 1 of 8. BAB/F/268/2 Approximative multiplication for Plan 28. Sheet 2 of 8. BAB/F/268/3 Approximative multiplication for Plan 28. Sheet 3 of 8. BAB/F/268/4 Approximative multiplication for Plan 28. Sheet 4 of 8. BAB/F/268/5 Approximative multiplication for Plan 28. Sheet 5 of 8. BAB/F/268/6 Approximative multiplication for Plan 28. Sheet 6 of 8. BAB/F/268/7 Approximative multiplication for Plan 28. Sheet 7 of 8. BAB/F/268/8 Common multiplication for Plan 28. Sheet 8 of 8. BAB/F/269 First arrangement of the verticals for one barrel to do approximative multiplication. BAB/F/269/1 First arrangement of the verticals for one barrel to do approximative multiplication. Notation 268. Sheet 1 of 2. BAB/F/269/2 First arrangement of the verticals for common multiplication. Notation 268. Sheet 2 of 2. BAB/F/271 Cases of division to illustrate the method of selecting with the half zero apparatus. BAB/F/271/1 Cases of division to illustrate the method of selecting with the half zero apparatus. Sheet 1 of 2. BAB/F/271/2 Cases of division to illustrate the method of selecting with the half zero apparatus of Plan 28. Sheet 2 of 2. BAB/F/272 Division. Rough drafts of parts of Notations 272 and 273. BAB/F/273 Directive for division. Four barrels. BAB/F/274 Directive for multiplication. Four barrels. BAB/F/275 Vertical movements of axes ordered by left and right barrels for multiplication. BAB/F/275/1 Vertical movements of axes ordered by right barrel for multiplication compiled in part from a genealogical notation. Sheet 1 of 3. BAB/F/275/2 Vertical movements of axes ordered by right barrel for multiplication compiled in part from a genealogical notation. Sheet 2 of 3. BAB/F/275/3 Vertical movements of axes ordered by left barrel for multiplication compiled in part from a genealogical notation. Sheet 3 of 3. BAB/F/276 Vertical movements of axes ordered by barrels for division. BAB/F/276/1 Vertical movements of axes ordered by right barrel for division. Compiled from a genealogical notation. Sheet 1 of 3. BAB/F/276/2 Vertical movements of axes ordered by middle barrel for division. Sheet 2 of 3. BAB/F/276/3 Vertical movements of axes ordered by left barrel for division. Sheet 3 of 3. BAB/F/277 Algebraic addition of k figures. BAB/F/278 Algebraic addition and algebraic subtraction. BAB/F/279 Algebraic addition of i k figures. BAB/F/283 Description of parts and their duties. Plan 28. BAB/F/286 Algebraic addition of k figures. BAB/F/287 Algebraic addition of k figures. Algebraic subtraction of k figures. BAB/F/288 Verticals on barrel of mill counting apparatus. BAB/F/289 Verticals for barrels for multiplication. BAB/F/289/1 Verticals for counting barrel for multiplication. Notation 268. Sheet 1 of 4. BAB/F/289/2 Verticals for right and table barrel for multiplication. Notation 268. Sheet 2 of 4. BAB/F/289/3 Verticals for left and middle barrels for multiplication. Notation 268. Sheet 3 of 4. BAB/F/289/4 Verticals for two barrels for counting apparatus for multiplication. Notation 268. Sheet 4 of 4. BAB/F/290 Division as performed with General Plans 28 and 28a and mill counting apparatus. BAB/F/290/01 Division as performed with General Plans 28 and 28a and mill counting apparatus. Sheet 1 of 15. BAB/F/290/02 Division. Sheet 2 of 15. BAB/F/290/03 Division. Sheet 3 of 15. BAB/F/290/04 Division. Sheet 4 of 15. BAB/F/290/05 Division. Sheet 5 of 15. BAB/F/290/06 Division. Sheet 6 of 15. BAB/F/290/07 Division. Sheet 7 of 15. BAB/F/290/08 Division. Sheet 8 of 15. BAB/F/290/09 Division. Sheet 9 of 15. BAB/F/290/10 Division. Sheet 10 of 15. BAB/F/290/11 Division. Sheet 11 of 15. BAB/F/290/12 Division. Sheet 12 of 15. BAB/F/290/13 Division. Sheet 13 of 15. BAB/F/290/14 Division. Sheet 14 of 15. BAB/F/290/15 Division. Sheet 15 of 15. BAB/F/291 Verticals of the counting apparatus, table, right, middle and left barrels. BAB/F/291/1 Verticals of the counting apparatus barrel for division as performed with Plan 28, Notation 290 and mill counting apparatus sketched on Drawings 125 and 126. Sheet 1 of 9. BAB/F/291/2 Verticals of the counting apparatus barrel. Sheet 2 of 9. BAB/F/291/3 Verticals of the counting apparatus barrel. Sheet 3 of 9. BAB/F/291/4 Verticals of table barrel. Sheet 4 of 9. BAB/F/291/5 Verticals of right barrel. Sheet 5 of 9. BAB/F/291/6 Verticals of middle barrel. Sheet 6 of 9. BAB/F/291/7 Verticals of left barrel. Sheet 7 of 9. BAB/F/291/8 Verticals of the counting apparatus barrel number 1. Sheet 8 of 9. BAB/F/291/9 Verticals of the counting apparatus barrel number 2. Sheet 9 of 9. BAB/F/292 Algebraic addition of k figures for algebraic card +. BAB/F/295 Algebraic addition of i k figures. BAB/F/296 Algebraic give off and retain for k figures. BAB/F/298/1 Algebraic addition. Sheet 1 of 2. BAB/F/298/2 Algebraic addition. Sheet 2 of 2. BAB/F/299 Algebraic addition, give off and retain for General Plan 28. BAB/F/299/1 Algebraic addition give off and retain for General Plan 28. Sheet 1 of 2. BAB/F/299/2 Algebraic addition, give off and retain. Sheet 2 of 2. BAB/F/300 Algebraic addition of i k figures. Multiplication. BAB/F/301 Algebraic addition of i k figures for General Plan 28. BAB/F/301/1 Algebraic addition of i k figures for General Plan 28 (Summary). Sheet 1 of 2. BAB/F/301/2 Algebraic addition of i k figures for General Plan 28 (Summary). Sheet 2 of 2. BAB/F/302 Algebraic addition with giving off (summary). BAB/F/303 Algebraic addition of k figures. BAB/F/304 Algebraic addition with giving off and retain. BAB/F/304/1 Algebraic addition with giving off. Sheet 1 of 2. BAB/F/304/2 Algebraic addition with giving off and retain. Sheet 2 of 2. BAB/F/305 Algebraic addition of k figures with give off and without retaining for General Plan 28. BAB/F/306 Algebraic addition of k figures. BAB/F/306/1 Algebraic addition of k figures adapted to General Plan 28. Sheet 1 of 4. BAB/F/306/2 Algebraic addition of k figures. Sheet 2 of 4. BAB/F/306/3 Algebraic addition of k figures. Sheet 3 of 4. BAB/F/306/4 Algebraic addition of k figures. Sheet 4 of 4. BAB/F/307 Verticals for algebraic addition of k figures. BAB/F/307/1 Verticals for algebraic addition of k figures. Sheet 1 of 2. BAB/F/307/2 Verticals for algebraic addition of k figures. Sheet 2 of 2. BAB/F/308 Verticals for algebraic addition of k figures. BAB/F/308/1 Verticals for one barrel to do algebraic addition of k figures. Sheet 1 of 2. BAB/F/308/2 Verticals for algebraic addition of k figures. One barrel. Sheet 2 of 2. BAB/F/309 Analytical Engine. Algebraic addition of k figures. One barrel. BAB/F/310 Analytical Engine. Algebraic addition of k figures. BAB/F/311 Algebraic addition of k figures. BAB/F/312 Algebraic addition of k figures. Three barrels. BAB/F/313 Verticals for one barrel to perform algebraic addition of k figures with General Plan 28. BAB/F/313/1 Verticals for one barrel to perform algebraic addition of k figures with General Plan 28. Sheet 1 of 2. BAB/F/313/2 Verticals for one barrel to perform algebraic addition of k figures with General Plan 28. Sheet 2 of 2. BAB/F/314/1 Multiplication. One barrel. Sheet 1 of 2. BAB/F/314/2 Multiplication. One barrel. Sheet 2 of 2. BAB/F/315/1 Multiplication. One barrel. Sheet 1 of 2. BAB/F/315/2 Multiplication. One barrel. Sheet 2 of 2. BAB/F/316 List of verticals on one barrel for division (Notation 290) with the equivalent verticals on five barrels to order the same work. BAB/F/317/1 Genealogy of multiplication. Sheet 1 of 2. BAB/F/317/2 Genealogy of multiplication. One barrel. Sheet 2 of 2. BAB/F/318 Verticals for one barrel of 278 verticals to perform division with General Plan 28. BAB/F/318/1 Verticals for one barrel of 278 verticals to perform division with General Plan 28. Sheet 1 of 3. BAB/F/318/2 Verticals for one barrel of 278 verticals to perform division with General Plan 28. Sheet 2 of 3. BAB/F/318/3 Verticals for one barrel of 278 verticals to perform division with General Plan 28. Sheet 3 of 3. BAB/F/319 List of verticals on one barrel for multiplication (Notation 268) with the equivalent verticals on five barrels to order the same work. BAB/F/320 Second arrangement of the verticals for one barrel to perform multiplication in the manner exhibited on Notation 268 and with General Plan 28 and 28a. BAB/F/321 Algebraic addition of i k figures. BAB/F/321/1 Algebraic addition of i k figures by the method described in Sketch Book Vol IV p 95 and with General Plan 28. Sheet 1 of 8. BAB/F/321/2 Algebraic addition of i k figures. Sheet 2of 8. BAB/F/321/3 Algebraic addition of i k figures. Sheet 3 of 8. BAB/F/321/4 Algebraic addition of i k figures. Sheet 4 of 8. BAB/F/321/5 Algebraic addition of i k figures. Sheet 5 of 8. BAB/F/321/6 Algebraic addition of i k figures. Sheet 6 of 8. BAB/F/321/7 Algebraic addition of i k figures. Sheet 7 of 8. BAB/F/321/8 Algebraic addition of i k figures. Sheet 8 of 8. BAB/F/322 Verticals for algebraic addition of i k figures. Notation 321. BAB/F/322/1 Verticals of algebraic addition of i k figures. Notation 321. Sheet 1 of 3. BAB/F/322/2 Verticals of algebraic addition of i k figures. Notation 321. Sheet 2 of 3. BAB/F/322/3 Verticals of algebraic addition of i k figures. Notation 321. Sheet 3 of 3. BAB/F/323 Verticals upon four barrels for algebraic addition of i k figures. Notation 321. BAB/F/323/1 Verticals upon four barrels for algebraic addition of i k figures. Notation 321. Sheet 1 of 2. BAB/F/323/2 Verticals upon four barrels for algebraic addition of i k figures. Notation 321. Sheet 2 of 2. BAB/F/324 Notation of cycle wheels. BAB/F/325 Notation of units for Plan 28. BAB/F/327 Vertical motions of the wheels and axes of the right, middle and left groups of Plan 28 for multiplication as performed in working Notation 268. BAB/F/327/1 Vertical motions of the wheels and axes of the right, middle and left groups of Plan 28 for multiplication as performed in working Notation 268. Sheet 1 of 4. BAB/F/327/2 Untitled. [Vertical motions of the wheels and axes of the right, middle and left groups of Plan 28 for multiplication as performed in working Notation 268]. Sheet 2 of 4. BAB/F/327/3 Untitled. [Vertical motions of the wheels and axes of the right, middle and left groups of Plan 28 for multiplication as performed in working Notation 268]. Sheet 3 of 4. BAB/F/327/4 Untitled. [Vertical motions of the wheels and axes of the right, middle and left groups of Plan 28 for multiplication as performed in working Notation 268]. Sheet 4 of 4. BAB/F/328 Vertical motions of the wheels and axes of the right, middle and left groups of Plan 28 for algebraic addition of k figures as performed in Notations 306 and 306x. BAB/F/329 Vertical position of the axes, wheels, et cetera, of right group of Plan 28 while performing multiplication as in Notation 268. BAB/F/330 Vertical motions of the wheels and axes of the right, middle and left groups of Plan 28 for algebraic addition of i k figures as performed in Notation 321. BAB/F/330/1 Vertical motions of the wheels and axes of the right, middle and left groups of Plan 28 for algebraic addition of i k figures as performed in Notation 321. Sheet 1 of 2. BAB/F/330/2 Vertical motions for algebraic addition of i k figures. Sheet 2 of 2. BAB/F/331 Trains and vertical motions of the wheels and axes of the right, middle and left groups of Plan 28a for division as performed in working Notation 290. BAB/F/331/1 Trains and vertical motions of the wheels and axes of the right, middle and left groups of Plan 28a for division as performed in working Notation 290. Sheet 1 of 4. BAB/F/331/2 Untitled. [Trains and vertical motions of the wheels and axes of the right, middle and left groups of Plan 28a for division as performed in working Notation 290]. Sheet 2 of 4. BAB/F/331/3 Untitled. [Trains and vertical motions of the wheels and axes of the right, middle and left groups of Plan 28a for division as performed in working Notation 290]. Sheet 3 of 4. BAB/F/331/4 Untitled. [Trains and vertical motions of the wheels and axes of the right, middle and left groups of Plan 28a for division as performed in working Notation 290]. Sheet 4of 4. BAB/F/332 Ascertaining if a variable = 0. Ascertaining if a variable has a + or - sign as performed by General Plans 28 and 28a. BAB/F/333 Finding the sum of the numbers of digits in two numbers P and Q and finding the difference of the numbers of digits in two numbers P and Q. Plans 28 and 28a. BAB/F/334 Differences as performed by General Plans 28 and 28a. BAB/F/334/1 Differences as performed by General Plans 28 and 28. Sheet 1 of 2. BAB/F/334/2 Differences as performed by General Plans 28 and 28a. Sheet 2 of 2. BAB/F/335 Stepping up or down or multiplying or dividing by any power of ten. Plans 28 and 28a. BAB/F/335/1 Stepping up or down or multiplying or dividing by any power of ten. Plans 28 and 28a. Sheet 1 of 2. BAB/F/335/2 Stepping up or down or multiplying or dividing by any power of ten. Plans 28 and 28a. Sheet 2 of 2. BAB/F/336 Notation of verticals for working Notations 332 and 333. BAB/F/337 Notation of verticals for differences (Notation 334) and stepping up or down Notation 335. BAB/F/338 Notation of units for General Plan 28. Superseded by 353. BAB/F/338/1 Notation of units for General Plan 28. Superseded by 353. Sheet 1 of 7. BAB/F/338/2 [Notation of units for General Plan 28]. Superseded by 353. Sheet 2 of 7. BAB/F/338/3 [Notation of units for General Plan 28]. Superseded by 353. Sheet 3 of 7. BAB/F/338/4 [Notation of units for General Plan 28]. Superseded by 353. Sheet 4 of 7. BAB/F/338/5 [Notation of units for General Plan 28]. Superseded by 353. Sheet 5 of 7. BAB/F/338/6 [Notation of units for General Plan 28]. Superseded by 353. Sheet 6 of 7. BAB/F/338/7 [Notation of units for General Plan 28]. Superseded by 353. Sheet 7 of 7. BAB/F/339 List of cycles with their vertical motions. BAB/F/340 Vertical motions of cycles a and a e.
BAB/F/341 Vertical motions of the wheels and axes of the centre group. BAB/F/341/1 Vertical motions of the wheels and axes of the centre group. Sheet 1 of 4. BAB/F/341/2 Vertical motions of the wheels and axes of the centre group. Plans 28 and 28a. Sheet 2 of 4. BAB/F/341/3 Vertical motions of the wheels and axes of the centre group. Sheet 3 of 4. BAB/F/341/4 Vertical motions of the wheels and axes of the centre group. Sheet 4 of 4. BAB/F/342 Motions of some of the axes. BAB/F/343 Motions of some of the axes for Plan 28. BAB/F/343/1 Motions of some of the axes for Plan 28. Sheet 1 of 8. BAB/F/343/2 Motions of some of the axes for Plan 28. Sheet 2 of 8. BAB/F/343/3 Motions of some of the axes for Plan 28. Sheet 3 of 8. BAB/F/343/4 Motions of some of the axes for Plan 28. Sheet 4 of 8. BAB/F/343/5 Motions of some of the axes for Plan 28. Sheet 5 of 8. BAB/F/343/6 [Motions of some of the axes for Plan 28]. Sheet 6 of 8. BAB/F/343/7 [Motions of some of the axes for Plan 28]. Sheet 7 of 8. BAB/F/343/8 [Motions of some of the axes for Plan 28]. Sheet 8 of 8. BAB/F/344 Lockings (circular) of Plan 28. BAB/F/344/1 Lockings (circular) of Plan 28. Sheet 1 of 2. BAB/F/344/2 [Lockings (circular) of Plan 28]. Sheet 2 of 2. BAB/F/345 Vertical motions of the wheels and axes of the middle group of Plan 28a for algebraic addition of k figures as performed in Notations 306 and 306x. BAB/F/346 Vertical motions of the wheels and axes of the middle group of Plan 28 for algebraic addition of i k figures as performed in Notation 321. BAB/F/346/1 Vertical motions of the wheels and axes of the middle group of Plan 28 for algebraic addition of i k figures as performed in Notation 321. Sheet 1 of 2. BAB/F/346/2 Vertical motions for algebraic addition of i k figures. Sheet 2 of 2. BAB/F/347 List of the vertical movements in the left middle and right groups. BAB/F/347/1 List of the vertical movements in the left middle and right groups. Sheet 1 of 2. BAB/F/347/2 List of the vertical movements in the left middle and right groups distributed by heights and cycles. Sheet 2 of 2. BAB/F/348/1 Trains and vertical motions of the wheels and axes of the right, middle and left groups of Plan 28a for multiplication as performed in working Notation 268. Sheet 1 of 3. BAB/F/348/2 Trains and vertical motions for multiplication. Sheet 2 of 3. BAB/F/349 Analysis of verticals on left group for multiplication. BAB/F/350 Lockings of Plan 28a. BAB/F/351 Notation of units for cycles of c (=18) and of 2c units used for counting the digits in multiplication and division. BAB/F/352 Vertical positions of some of the wheels of Plan 28a. Notation 348 cycles. BAB/F/352/01 Vertical positions of some of the wheels of Plan 28a. Notation 348 cycles. Sheet 1 of 13. BAB/F/352/02 Notation 348 cycle 18. Sheet 2 of 13. BAB/F/352/03 Notation 348 cycle 19. Sheet 3 of 13. BAB/F/352/04 Notation 348 cycle 20. Sheet 4 of 13. BAB/F/352/05 Notation 348 cycles 26 and 27. Sheet 5 of 13. BAB/F/352/06 Notation 348 cycle 26. Sheet 6 of 13. BAB/F/352/07 Notation 348 cycles 26 and 27. Sheet 7 of 13. BAB/F/352/08 Notation 348 cycle 26. Sheet 8 of 13. BAB/F/352/09 Notation 331 cycles 21 and 26. Sheet 9 of 13. BAB/F/352/10 Notation 331 cycle 23 and 24. Sheet 10 of 13. BAB/F/352/11 Untitled. [Vertical positions of some of the wheels of Plan 28a. Notation 348 and 331 cycles]. Sheet 11 of 13. BAB/F/352/12 Untitled. [Vertical positions of some of the wheels of Plan 28a. Notation 348 and 331 cycles]. Sheet 12 of 13. BAB/F/352/13 Untitled. [Vertical positions of some of the wheels of Plan 28a. Notation 348 and 331 cycles]. Sheet 13 of 13. BAB/F/353 Notation of units for General Plan 28a. BAB/F/353/1 Notation of units for General Plan 28a. Sheet 1 of 6. BAB/F/353/2 Notation of units for General Plan 28a. Sheet 2 of 6. BAB/F/353/3 Notation of units for General Plan 28a. Sheet 3 of 6. BAB/F/353/4 Notation of units for General Plan 28a. Sheet 4 of 6. BAB/F/353/5 Notation of units for General Plan 28a. Sheet 5 of 6. BAB/F/353/6 Notation of units for mill counting apparatus drawings 125, 126 and 137 and for sign wheel drawing. Sheet 6 of 6. BAB/F/354 Times of lockings in various cycles for Plan 28. BAB/F/354/1 Times of lockings in various cycles for Plan 28. Sheet 1 of 2. BAB/F/354/2 Untitled. [Times of lockings in various cycles for Plan 28]. Sheet 2 of 2. BAB/F/355 Trains and vertical motions of the wheels and axes of the centre group for differences and of the right group for stepping up or down. Plan 28a. BAB/F/356 Untitled. [Verticals. Motions of the wheels and axes for Plan 28]. BAB/F/356/1 Untitled. [Verticals. Motions of the wheels and axes for Plan 28]. Sheet 1 of 2. BAB/F/356/2 Untitled. [Verticals. Motions of the wheels and axes for Plan 28]. Sheet 2 of 2. BAB/F/357 Duties of the calculating mechanism of left, centre and right groups of Plan 28a. BAB/F/357/01 Duties of the calculating mechanism of left, centre and right groups of Plan 28a. Right group. Sheet 1 of 11. BAB/F/357/02 Duties of the calculating mechanism of left, centre and right groups of Plan 28a. Right group. Sheet 2 of 11. BAB/F/357/03 Duties of the calculating mechanism of Plan 28a. Centre group. Sheet 3 of 11. BAB/F/357/04 Duties of the calculating mechanism of Plan 28a. Centre group. Sheet 4 of 11. BAB/F/357/05 Duties of the calculating mechanism of Plan 28a. Centre group. Sheet 5 of 11. BAB/F/357/06 Duties of the calculating mechanism of left, centre and right groups of Plan 28a. Centre group. Sheet 6 of 11. BAB/F/357/07 Duties of the calculating mechanism of Plan 28a. Centre group. Sheet 7 of 11. BAB/F/357/08 Duties of the calculating mechanism of Plan 28a. Centre group. Sheet 8 of 11. BAB/F/357/09 Duties of the calculating mechanism of Plan 28a. Left group. Sheet 9 of 11. BAB/F/357/10 Duties of the calculating mechanism of Plan 28a. Left group. Sheet 10 of 11. BAB/F/357/11 Duties of the calculating mechanism of Plan 28a. Left group. Sheet 11 of 11. BAB/F/358 Analysis of the trains with reference to cycles and verticals. BAB/F/358/1 Analysis of the trains with reference to cycles and verticals. Right group. Sheet 1 of 3. BAB/F/358/2 Analysis of the trains with reference to cycles and verticals. Centre group. Sheet 2 of 3. BAB/F/358/3 Analysis of the trains with reference to cycles and verticals. Left group. Sheet 3 of 3. BAB/F/359 Trains and vertical motions of the wheels and axes of the table group of Plan 28a for multiplication, as performed in working Notation 268 and for stepping up or down. BAB/F/360 Trains and vertical motions of the wheels and axes of the table group of Plan 28a for division, as performed in working Notation 290 and for ascertaining if a variable has a + or - sign. BAB/F/361 Trains and vertical motions of the wheels and axes ordered by barrel no. 1 of the mill counting apparatus of Plans 28 and 28a for multiplication, as performed in the working Notation 268. BAB/F/361/1 Trains and vertical motions of the wheels and axes ordered by barrel no. 1 of the mill counting apparatus of Plans 28 and 28a for multiplication, as performed in the working Notation 268. Sheet 1 of 2. BAB/F/361/2 Trains and vertical motions of the wheels and axes ordered by barrel no. 2 of the mill counting apparatus of Plans 28 and 28a for multiplication, as performed in the working Notation 268. Sheet 2 of 2. BAB/F/362 Trains and vertical motions of the wheels and axes ordered by barrel no. 1 of the mill counting apparatus of Plans 28 and 28a for division, as performed in working Notation 290. BAB/F/362/1 Trains and vertical motions of the wheels and axes ordered by barrel no. 1 of the mill counting apparatus of Plans 28 and 28a for division, as performed in working Notation 290. Sheet 1 of 2. BAB/F/362/2 Trains and vertical motions of the wheels and axes ordered by barrel no. 2 of the mill counting apparatus of Plans 28 and 28a for division, as performed in working Notation 290. Sheet 2 of 2. BAB/F/363 Trains and vertical motions of the wheels and axes of the table group of Plan 28a for algebraic addition, as performed in working Notations 306 and 321. BAB/F/364 Notations of periods ready for copying. BAB/F/365 Notation of periods for table axes. BAB/F/366 Notation of periods for mill counting apparatus. BAB/F/367 Notation of periods for right group. BAB/F/367/1 Notation of periods for right group. Sheet 1 of 5. BAB/F/367/2 Notation of periods for right group. Sheet 2 of 5. BAB/F/367/3 Notation of periods for right group. Sheet 3 of 5. BAB/F/367/4 Notation of periods for right group. Sheet 4 of 5. BAB/F/367/5 Notation of periods for right group. Sheet 5 of 5. BAB/F/368 Notation of periods for the centre group. BAB/F/369 Duties of the mill counting apparatus which require the cycle of 2c(=36) units for Plan 28a. BAB/F/369/1 Duties of the mill counting apparatus which require the cycle of 2c(=36) units for Plan 28a. Sheet 1 of 2. BAB/F/369/2 Duties of the mill counting apparatus which require the cycle of a(=12) units for Plan 28a. Sheet 2 of 2. BAB/F/370 Duties of the calculating mechanism of Plan 28a table group. BAB/F/370/1 Duties of the calculating mechanism of Plan 28a table group. Sheet 1 of 2. BAB/F/370/2 Duties of the calculating mechanism of Plan 28a table group. Sheet 2 of 2. BAB/F/371/1 Analysis of lockings. Right Group. Sheet 1 of 4. BAB/F/371/2 Analysis of the lockings. Centre group. Sheet 2 of 4. BAB/F/371/3 Analysis. Sheet 3 of 4. BAB/F/371/4 Analysis of the lockings on the left group. Sheet 4 of 4. BAB/F/372 Vertical motions for multiplication, division, addition and differences. BAB/F/372/1 Right group. Vertical motions arranged by cycles. Multiplication and division. Sheet 1 of 5. BAB/F/372/2 Untitled. [Vertical motions for multiplication and division]. Sheet 2 of 5. BAB/F/372/4 Mill counting apparatus. Vertical motions of the axes ordered by barrel no. 2. Sheet 4 of 5. BAB/F/372/5 Table group. Sheet 5 of 5. BAB/F/373 Skeleton of vertical motions for all operations. BAB/F/373/1 Skeleton of vertical motions for all operations. Right groups. Multiplication and division from 372 Sheet 1. Sheet 1 of 3. BAB/F/373/2 Skeleton of vertical motions for all operations. Left group. Sheet 2 of 3. BAB/F/373/3 Skeleton of vertical motions for all operations. Centre group. Sheet 3 of 3. BAB/F/374 Abstract of vertical motions arranged by cycles. Centre group. BAB/F/375 Combination of the cycles of the groups; right, centre, left, table. BAB/F/375/1 Combination of the cycles of the groups; right, centre, left, table, for multiplication. Sheet 1 of 2. BAB/F/375/2 Combination of the cycles of the groups, right, centre, left, table. Sheet 2 of 2. BAB/F/376 Skeleton of vertical motions of left, centre, right, table groups and mill counting apparatus. BAB/F/376/1 Skeleton of vertical motions of left group. Sheet 1 of 6. BAB/F/376/2 Skeleton of vertical motions of centre group. Sheet 2 of 6. BAB/F/376/3 Untitled. [Skeleton of vertical motions of right group]. Sheet 3 of 6. BAB/F/376/4 Untitled. [Skeleton of vertical motions of table group. Sheet 4 of 6. BAB/F/376/5 Untitled. [Skeleton of vertical motions of mill counting apparatus barrel no. 1]. Sheet 5 of 6. BAB/F/376/6 Untitled. [Skeleton of vertical motions of mill counting apparatus barrel no. 2.] Sheet 6 of 6. BAB/F/377 List of the combinations in multiplication performed in Notation 268, with the cycles in which they occur. BAB/F/378 List of the combinations in division performed as in Notation 290, with the cycles in which they occur. BAB/F/378/1 List of the combinations in division performed as in Notation 290, with the cycles in which they occur. Sheet 1 of 4. BAB/F/378/2 List of the combinations in division performed as in Notation 290, with the cycles in which they occur. Sheet 2 of 4. BAB/F/378/3 List, et cetera. [List of the combinations in division performed as in Notation 290, with the cycles in which they occur] Sheet 3 of 4. BAB/F/378/4 Untitled. [List of the combinations in division performed as in Notation 290, with the cycles in which they occur] Sheet 4 of 4. BAB/F/379 List of the combinations in division performed as in Notation 290, with the cycles in which they occur. BAB/F/380 List of the cases in multiplication as performed in Notation no. 268. BAB/F/381 List of the cases in division as performed in Notation 290. BAB/F/382 Notation of units anticipating whole zero cycles by circular chain. BAB/F/383 Notation of units for Difference Engine calculating part. BAB/F/383/1 Notation of units for Difference Engine calculating part. Sheet 1 of 2. BAB/F/383/2 Notation of units for Difference Engine No. 2 calculating part. Sheet 2 of 2. BAB/F/384 Notation of units for stereotype printing apparatus. BAB/F/385 Notation of units for Difference Engine No. 2. BAB/F/385/1 Notation of units for Difference Engine No. 2. Sheet 1 of 2. BAB/F/385/2 Notation of units for various methods of giving motion to Difference Engine No. 2. Sheet 2 of 2. BAB/F/387 Analytical Engine. Notation of units of incommensurable cycle wheel. BAB/F/388 Notation of units of apparatus for combining incommensurable cycles (Drawing 142). BAB/G/001 General plan of Analytical Engine, quarter size. BAB/G/002 Rising platform and selectors for variable columns in store one to each half of store. Quarter size. BAB/G/003 Store variable selectors. Superseding drawing No 2. BAB/G/004 General plan of the Analytical Engine, half size. BAB/G/005 Whole zero anticipating carriage with one plate in each cage. BAB/G/006 Half zero anticipating carriage with three plates in each cage. BAB/G/007 Plans for the moulds for anticipating carriage. BAB/G/008 Mould for wheel of eighty teeth. Adding column. BAB/G/009 Mould for warning pinion. BAB/G/010 Untitled, appears to represent the printing mechanism. BAB/G/011 Print apparatus as made in the large model. BAB/G/012 Probably a plan of carriage and figure columns. BAB/G/013 Plan of motion for carriage slide. BAB/G/015 Motion for carrying the tens, plus and minus. BAB/H Notation of units of the Difference Engine No. 2. BAB/H/001 Sheet 1 showing driving, odd difference sectors, circular motion and vertical motion. BAB/H/002 Sheet 2 showing odd difference figure wheels, circular motion, vertical motion; locking of odd difference figure wheels and odd difference warnings, circular motion. BAB/H/003 Sheet 3 showing odd difference warnings, vertical motion; even difference sectors, circular motion, vertical motion and even difference figure wheels, circular motion. BAB/H/004 Sheet 4 showing even difference figure wheels, vertical motion, locking of even difference figure wheels and even difference warnings, circular motion and vertical motion. BAB/H/005 Sheet 5 showing odd difference figure wheels; odd difference warnings; odd difference carriage; even difference sectors and even difference figure wheels. BAB/H/006 Sheet 6 showing even difference figure wheels; even difference warnings; large stereotype sectors, vertical motion and calculations conveyed to printing sectors, to large and small stereotype sectors. BAB/H/007 Sheet 7 showing locking of large stereotype sectors, printing sectors, figure racks, printing racks and small stereotype sector, vertical motion. BAB/H/008 Sheet 8 showing paper rollers, inking rollers, copper plate motion [column to column motion]. BAB/H/009 Sheet 9 showing copper plate motion. BAB/J/004 Notation of units. Circular motions of the calculating axes. Odd difference warnings and figure wheels. BAB/J/005 Notation of units. Vertical motions. Even and odd difference sectors. BAB/J/007 Notation of units. Vertical motions of the calculating axes. Even and odd difference warnings. BAB/J/008 Notation of units. Calculating axes. BAB/J/015 Notation of units. Motions of the printing apparatus. BAB/J/021 General trains. Circular motion of axes. BAB/J/022 Trains. Vertical motions of axes. BAB/J/024 Trains for stereotype frames. BAB/J/027 General trains to be used with Sheets 1 to 4 of the special trains on drawing paper. BAB/J/028 Analytical and Difference Engine. Notations of units. Copper plate moving. BAB/J/033 Printing. Analytical and Difference Engine. BAB/J/034 Direct trains. Third edition [possibly version]. BAB/J/035 Complete analysis of trains. Second Edition [possibly version]. BAB/J/036 Stereotype plate movements. Fourth Edition [possibly version]. BAB/J/038 Notation of units. First Edition [possibly version]. BAB/J/040 The trains. Calculating. Second Edition [possibly version]. BAB/J/042 Comparison of two modes of moving matrix frame. BAB/J/043 Description of copper plate moving apparatus. BAB/J/044 Number of parts and working points. BAB/K/027 Plan of machinery intended to be attached to planing machine. BAB/K/029 First 60 wheel & 7 levers - old plan. BAB/K/042 Levers for cones, single teeth, &c.